I’m not sure whether to view this image as a still frame from an over-the-top disaster movie, as a piece of subtle-as-a-sledgehammer environmental propaganda, or just as a visually interesting play on the fact that climate change will increase the likelihood of ‘washover events’ and coastal inundation as sea levels rise. In any event the small figures which can be seen at the far end of the road bridge should probably be running in terror from the approaching wave, rather than standing there casually fishing. The road bridge is extracted from a photograph of the naval wharf at Edrom Point – the same one as seen submerged in Humpback flight. The wave was photographed at Depot Beach (north of Bateman’s Bay) where, when the swell is big enough and when the tide is right, the waves wrap around a small island off the headland and produce marvellous interference patterns as they collide. Behind Aslings Beach in the town of Eden, a fairly low dune protects Lake Curalo and the lower parts of the town from inundation by the sea. 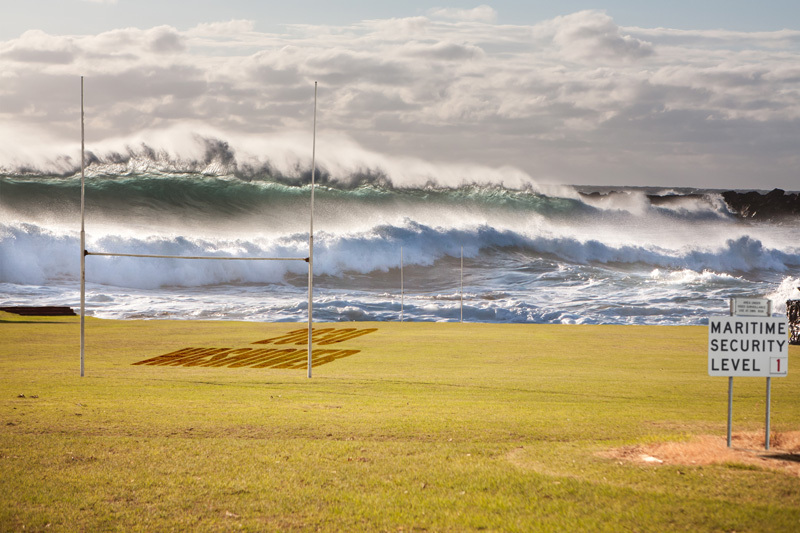 If the dune were to be breached by the surf – which is more likely with rising sea levels and greater incidence of extreme weather events – one of the first areas to be inundated would be the sports field of the High School. 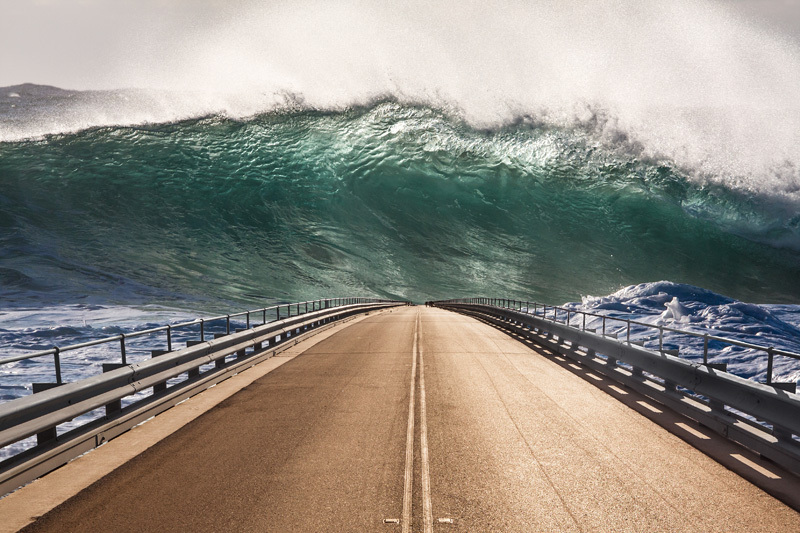 This composite image gives a fanciful vision of such a ‘washover event’, replacing the gentle lakeside view behind the football field with a turbulent set of ocean waves from Depot Beach. The ‘Maritime Security Level’ sign, which I have relocated from the entrance to the Edrom Point naval wharf, assumes a new meaning for ‘security’. The Eden Cemetery is located just on the town side of the Aslings Beach sand dune. It contains many graves from the 19th Century, the oldest known being from 1834. Some of the oldest graves now lie below the road which was constructed along the top of the consolidated dune. The inscriptions are indicative of the difficulties of life for the early settlers and mariners of the region, with many drownings: “who departed this life at sea”, “died at sea on her passage from Launceston”, “my dear husband and children, drowned at Eden”. If the Aslings Beach dune were to be breached by the sea in a ‘washover event”, the ocean could claim them for a second time. 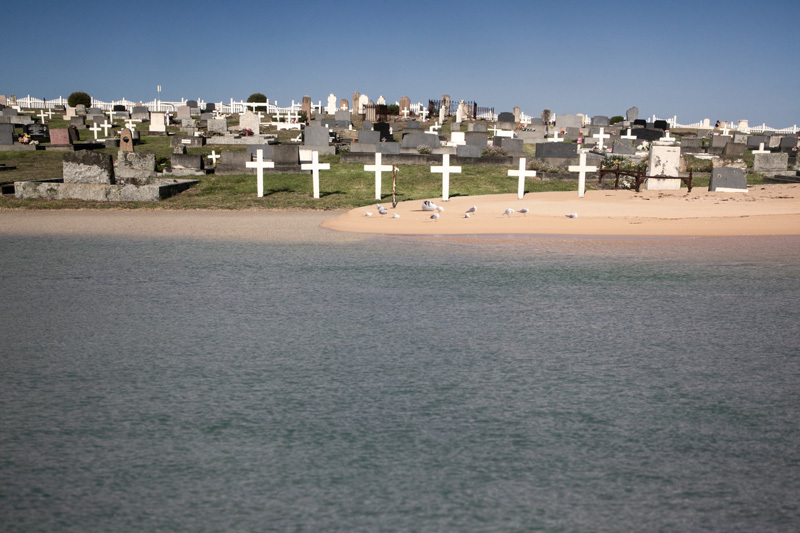 This composite picture imagines the lower parts of the cemetery under water, with fresh sand banks amongst the graves. This entry was posted in Human landscapes, Photos and tagged ANU School of Art, climate change, Eden, Edrom Point, SECA, South East Coastal Adaptation Project. Bookmark the permalink.